Super Bright Flexible LED Tape, 11.5W per Meter 57.5Watts per 5M roll. Dimmable on both Line Voltage and Low Voltage Sides. Contact us for further details. 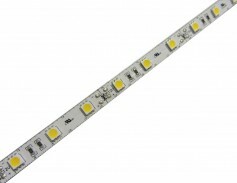 Silicone Protected LED Strip Lighting also stocked in 5M Lengths. After years of testing we now offer a flexible LED Tape that uses a more powerfull triple chip LED. These Flexible strip lights draw 11.5 Watts per Meter and are stable for long time use. -Flexible light that can be used in locations that have been impossible using other light sources. -Versatile size that can be used in virtually all indoor situations that need a thin strip light. -Easy Installation with double sided 3M tape.